Secretary of State Condoleezza Rice is accusing Iran and Syria of being behind the protests triggered by drawings of the Prophet Muhammad. During a news conference at the State Department with Israel's foreign minister, Rice said she has "no doubt" that Tehran and Damascus have "gone out of their way to inflame sentiments." 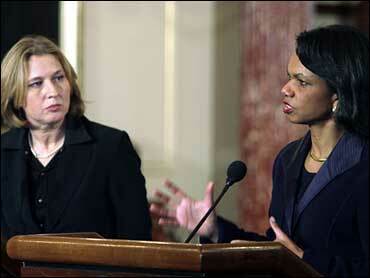 "The world ought to call them on it," Rice said. "Nothing justifies the violence that has broken out." Rice said this is a time when everyone should urge calm "and should urge that there is an atmosphere of respect and understanding." CBS News correspondent Sheila MacVicar reports U.S. officials are continuing to examine if there's a pattern of global incitement. "Other countries are having the same demonstrations, same problems, very violent demonstrations, starting peaceful, turning violent," Col. James Yonts said. As protests grow worldwide, President Bush also called for an end to violent demonstrations. "We reject violence as a way to express discontent with what may be printed in a free press," Mr. Bush said. "I call upon the governments around the world to stop the violence, to be respectful, to protect property, protect the lives of innocent diplomats who are serving their countries overseas," the president said. Mr. Bush also said that Americans believe in a free press, and added, "With freedom comes the responsibility to be thoughtful about others." He made his comments after a meeting with King Abdullah II of Jordan. "With all respect to press freedoms, obviously anything that vilifies the Prophet Muhammad ... or attacks Muslim sensibilities, I believe, needs to be condemned," the king said. He went on to say that those who want to protest "should do it thoughtfully, articulately, express their views peacefully." The Afghan protests have involved armed men and have been directed at foreign and Afghan government targets, fueling the suspicions there's more behind the unrest than religious sensitivities. "You have a combination of legitimate and deeply foul religious objection with political opportunism and part of this growing problem between the western world and Islamic world," Michael O'Hanlon, a senior fellow at the Brookings Institution, said on CBS News' The Early Show. But Yonts stressed they had no evidence to support suggestions that al Qaeda or Taliban are linked to the riots in Afghanistan. Four people were killed and at least 20 were wounded, officials said. More than 1,000 people also rallied Wednesday in Muslim-majority Bangladesh's capital, burning Danish and Italian flags. There were no immediate reports of violence. In France, President Jacques Chirac asked media to avoid offending religious beliefs as another French newspaper on Wednesday reprinted the prophet caricatures. Chirac said during a Cabinet meeting that he condemned "all obvious provocations likely to dangerously kindle passions." Besides reprinting the drawings, a satirical French weekly also printed new caricatures of its own. Denmark's prime minister called the protests over the Prophet Muhammad cartoons a "global crisis" and appealed Tuesday for calm. "It now is something else than the drawings ... now it has become an international political matter," Anders Fogh Rasmussen told a news conference. "I urge calm and steadiness.'" A prominent Iranian newspaper, Hamshahri, invited artists to enter a Holocaust cartoon competition, saying it wanted to see if freedom of expression — the banner under which many Western publications reprinted the prophet drawings — also applied to Holocaust images. Jyllands-Posten, the Danish newspaper that first published the Muhammad caricatures, said it will not publish the cartoons. The Afghan protesters set fire to three fuel tankers that were waiting to deliver gas to the base, Malakhail said. He said U.S. troops fired warning shots into the air. hundreds of university students marched peacefully through the capital, chanting "Death to the Danish! Death to Americans!" Meanwhile, Islamic organizations called for an end to the deadly rioting across the Muslim world over drawings of the Prophet Muhammad. "Islam says it's all right to demonstrate but not to resort to violence. This must stop," said senior cleric Mohammed Usman, a member of the Ulama Council, Afghanistan's top Islamic organization. "We condemn the cartoons but this does not justify violence. These rioters are defaming the name of Islam." Other members of the council went on radio and television Wednesday to appeal for calm. It followed a statement released by the United Nations, European Union and the world's largest Islamic group on Tuesday also urging an end to violence. Elsewhere on Wednesday, about 300 Palestinians attacked an international observer mission in the West Bank city of Hebron and tried to set one of the buildings on fire in a protest against the cartoons. Indonesia's foreign minister said Wednesday that radical groups around the world were exploiting public anger over the cartoons. "The cartoons have hurt the Islamic community, so it has added to ammunition for (global) radical groups to exploit the situation and the whole thing has got out of proportion," Indonesian Foreign Minister Hassan Wirajuda told reporters. Muslims also demonstrated for the third straight day in Indian-controlled Kashmir. In Turkey, police using armored vehicles blocked some 500 ultranationalist Turks from reaching the Danish Embassy and the demonstrators dispersed peacefully.